Army Sports Club produced a spectacular second half rally to beat the more fancied CH&FC 32-22 in their Clifford Cup Knock-Out Inter-Club Rugby Tournament quarter-final encounter worked off at the Racecourse Grounds in Reid Avenue yesterday. The Soldiers came out probably with their best performance for the current season as they mesmerized their opponents by collecting their points from two goals, three tries and one penalty. CH&FC after leading 17-12 at half time failed to consolidate their position and managed to score only a goal and three tries. The manner in which Army SC turned the game in their favour was quite outstanding as they were really up against a far superior outfit in both experience and skill. But they rallied around through their excellent teamwork with the forwards and the three quarters forming a successful combination before delivering the final blow in style. 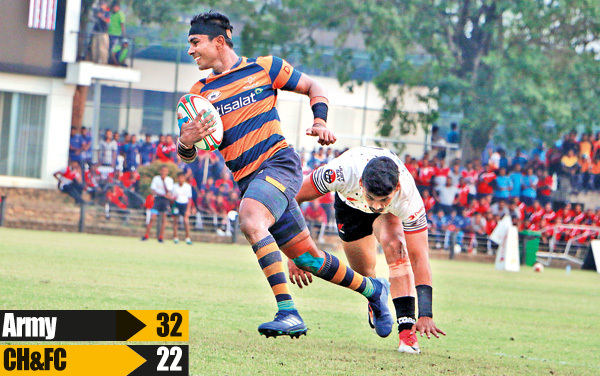 CH drew first blood as early as in the third minute of play when Sathya Ranatunga went over for a super try following a dazzling three quarter move. CH further increased the lead with Dilshan Chathura going over for another try while giving the reliable Samuel Maduwantha an easy kick at goal. Army SC got their act together well and planted their first try of the match in the 30th minute through Dhanushka Thalawatta with Isuru Medagedera adding the extra points. CH increased the lead to a commanding 17-7 when Anuradha Herath scored a splendid try in the 37th minute of play. Sameera Bulathsinghala scored a magnificent try for Army SC shortly before half time to make it 12-17 at the break. Army SC made their intentions quite clear after the turnaround with Ashan Bandara going over in the 42nd minute to level the scores 17-17. However, CH once again took the lead when Sajith Saranga went over for a beautiful try to make it 22-17 at that stage. Army came back storming with Madura Bandara slicing through the CH defence for a magnificent try and to level the scores once again 22-22. Ashan Bandara then planted the match winning try for Army SC in the 68th minute and Gayan Salinda added the extra points to make it 29-22. Army added the finishing touches in style when Salinda fired across a vital penalty and to increase the lead to a commanding 32-22 two minutes before the final whistle.